Bergdorf Blondes are a thing, you know, a New York craze. Absolutely everyone wants to be one, but it’s actually très difficult. You wouldn’t believe the dedication it takes to be a gorgeous, flaxen-haired, dermatologically perfect New York girl with a life that’s fabulous beyond belief. Honestly, it all requires a level of commitment comparable to, say, learning Hebrew or quitting cigarettes. Our heroine, “Moi,” described as a “champagne bubble of a girl about town,” gets into misadventures with fellow socialite and best friend Julie Bergdorf, a department store heiress. When Moi notices that getting engaged brings about a glow unattainable by facials, she and Julie scheme and shop to attract the perfect PH (Prospective Husband). Sykes’s debut is a pitch-perfect examination of the glittering lives of the young, rich, and fabulous living in New York. 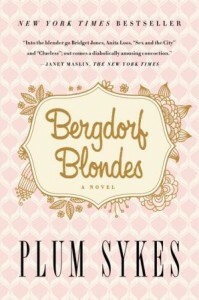 From New York Times bestselling author Plum Sykes comes the delicious follow-up to Bergdorf Blondes, a hilarious tale of marriage, friendship, and divorce. 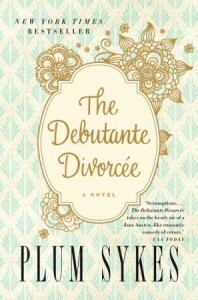 Filled with wit and charm, The Debutante Divorcée stars Sylvie Mortimer, a recently married socialite who is quick to discover that her marriage is far from photo-perfect. Her best friend, Lauren Blount, the chic-est of the Debutante Divorcées, is basking in her freedom, taking solo honeymoons, having divorce showers, and pursuing any man she chooses as part of her “Make-Out Challenge.” And Sylvie’s perfect Town & Country life is about to be rocked by a divine and dangerous predator—the very rich, very young, very thin, and very divorced Husband Huntress. Plum Sykes was born in London and educated at Oxford. The author of the novels Bergdorf Blondes and The Debutante Divorcée and the Kindle Single memoir Oxford Girl, she is a contributing editor at American Vogue, where she writes about fashion, society, and Hollywood. She has also written for Vanity Fair. She lives in the English countryside with her husband and two daughters.